Since our standard model enclosures are sold through distributors, often all we see is the order without much in the way of project or customer details. 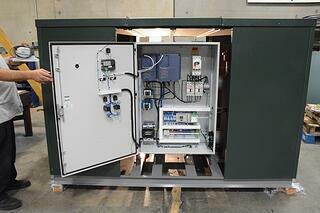 However, since we are also a custom enclosure manufacturer, we sometimes have direct contact with the end user. This allows us to work directly with the end user throughout the design and purchasing process. We interviewed the Safe-T-Cover staff member who worked with a customer on a recent custom order. This will help you see the process Safe-T-Cover uses to ensure your pump cover meets all your needs. Tell me about your first interaction with this customer. This customer called the office on April 5th, 2017. He and I first looked at the 200D model enclosure. We discussed the ability to include louvers and looked at color options. We discussed skid dimensions and how the enclosure would be mounted to the skid. He had reviewed options from two or three other manufacturers and said couldn't find a fit with his needs, so Safe-T-Cover seemed like the best option for this job. Over the next two weeks he and I exchanged emails. First we talked about adding an exhaust fan. After that, he relayed a question from his customer about water ponding on the roof. They were worried about the weight of the water warping the enclosure. I told him that would not be a problem from a structural standpoint as the materials we use are built to withstand heavy snow loading. He seemed satisfied with that and we moved forward. During the exchanges, a 400TD aluminum enclosure was selected as the model. On June 29th, 2017 we received a purchase order for the enclosure it. They selected hartford green as the color so that it would blend in better with the landscaping at the job site. What features did you include on the first drawing? Typically we provide a drawing or use one of the standard details we've created over time in our library. After hundreds of completed projects, we've amassed quite a few. However, it's not uncommon for the customer to actually provide us with a drawing. In this case that's what happened. They sent us a drawing to indicate where to install the louvers and the exhaust fan. Most of the time when we work on a custom pump cover like this, the customer is an engineer as well, so we'll collaborate on the design. How did the customer explain their needs and considerations? We used email to discuss the need to mount the pump cover on a skid, any special considerations involved with skid mounting, and the hardware that we would provide with the enclosure. Safe-T-Cover included brackets for mounting it to the skid. The customer mentioned they weren't sure if they'd need specialty hardware in addition to what we'd provided, but they ended up using our brackets and said they worked as intended. We also talked about how much internal heat would be generated by the control panel and a motor on their pump system. I guided him through how we'd alleviate that with louvers and a thermostatically controlled exhaust fan. How much back & forth communication did you have before the order was placed? We swapped about half a dozen emails before we received the purchase order. The outside dimensions of custom enclosures mounted to pump skids are important as the outside dimensions of our enclosure need to match the pump skid dimensions perfectly. Otherwise the cover could hang over a bit. The customer said our dimensions were very slightly too large for this project, but also said this was not a problem in this case. 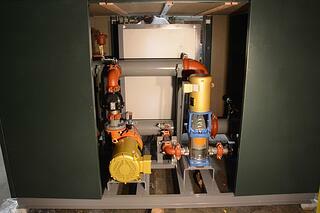 We'll make sure future installations fit the dimensions of the pump skid accurately. The customer made piping penetrations on site - How did you prepare them for that? I described to the customer the process of marking and cutting a hole in the enclosure. It's not very difficult when it comes to aluminum pump covers. They would be much more likely to run into problems with a fiberglass enclosure. He seemed to understand the instructions and be satisfied they could do the work. Have you had contact with the customer after delivery? I followed up with the customer in the middle of December to see how this custom pump cover worked out. He said the pump cover was well received. He did add they needed to install a weather hood to keep hands away from the exhaust fan blades as it was installed at an elementary school. This customer said the color looks nice, their team had no trouble cutting piping penetrations and mounting the enclosure to the skid. Now you've seen how Safe-T-Cover works with clients to design and build custom covers. This customer was satisfied with the product, and has actually ordered another in February 2018. This next enclosure will be built with two louvers but will not include a fan this time. For this project, the customer also discussed heating for the pump cover for winter and selected a slab mounted heater that will maintain 40°F in temperatures as low as -30°F. That way the pump equipment will stay at the correct temperature throughout the year. Since Safe-T-Cover staff had already built up a rapport, they simply exchanged a few emails with the customer and built on a drawing sent over to mark where the louvers and heater will be. 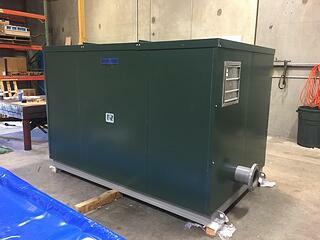 This hartford green enclosure was shipped within just two weeks of receiving the purchase order.